$1600 x 4 = $6,400 to visit the DC swamp instead of demanding in-district meetings with representatives. That number is before other expenses. Does anybody remember when Bloomington had an in-house lawyer? His total cost was close to what 3 months is costing for legal now. Funny how the cost/benefits are never discussed. Below is the artist fee for one act at the BCPA – $22,500. Capacity is 1180 if every seat is sold. The BCPA doesn’t post event reports, they should! This is more than most acts cost, did they make any money? Posted in BloNo, Bloomington, budgets, Local, Progressives, Renner, Taxes.Tagged BCPA, BN Advantage, EAC, employee party, One Voice, Sorling Northrup. 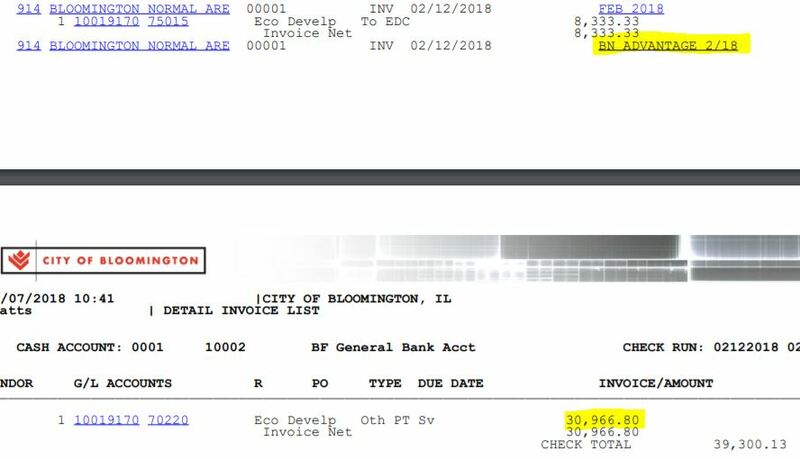 It’s amazing how much money it costs the Bloomington government to lose even more money and residents. What a load of bureaucratic crap . .. living it up and not caring about much but getting their self satisfied or strutting like they own this city . they work for us how They choose if it benefits them it seems .and the sad thing is I only see you Informing ,and few realize the folly going on . that’s how they continue . they do not inform the public of what or how they do , spend , or act upon matters . what good is openness with out facts and accountability ?. I wish Council members would admit to reading your blog. Of course if they admitted to reading it they might be held accountable for not being furious and appalled by the money they are spending. Diana Hauman suggested I register for Bloomington 101…I would like to suggest she take a basic math class and read a book or two about ethics and corruption. I certainly hope she enjoys her all expense paid trip to hell…which is likely where she’s headed if she keeps following Tari. Diane Hauman doesn’t even know what property taxes pay are to pay for. She thinks property taxes pay for water and other city services. Doesn’t she get a water bill? Looks like it’s time to remind Hauman how she came to be a council member in the first place to get her and Steve back in their places. $85,000 for a playground, too. So you want kids to get hurt on equipment needing to be replaced? Maybe move in some straw bails instead of buying new? That $$ is in next year’s budget. The playground/park could be considered for public health. You know, fresh air, sunshine, exercise, playtime and human interaction. This is not the same as $10M for a soccer complex. It is also not tens of thousands of dollars for EDC that doesn’t generate any economic development. I just WISH the council could pull their heads out LONG ENOUGH to see what they have done here! The roads are horrible, with NO fixes, seems EVERY DAY there is a street closed due to a water main break. We were SUPPOSED to save money with these NEW garbage/recycle bins. Etc.. Meanwhile they travel on a “junket” and live like boss Tweed and for what, so they can SPEND more money! All these trips all these expenses, doesnt anyone have SKYPE ? Its the 21st Century why dont they Skype all these conferences? It would be a heck of alot cheaper that way! I know the answer: just another way to get away from the wife and kiddies and party! More like it’s the best way to have one-on-one conversations that are not subject to FOIA which cover issues on how to get away with this-and-that, as per the more experienced that are the swamp who live, work, and play in the District of Criminals.